Jai Ram, Guru Nanak's brother-in-law was serving as dewan (steward) to the governor, Nawab Daulat Khan Lodhi of Sultanpur. It is said that both Jai Ram and Rai Bular were of the opinion that Guru Nanak was a saint ill-treated by his father; and thus Jai Ram promised to find a job for him in Sultanpur. Guru Nanak's sister was deeply devoted to her younger brother. On their annual visit to Talwandi, when she noticed her father's impatience at her brother's indifference towards worldly activities, she decided to take him to Sultanpur. Her father gave his consent hoping he would choose a good profession. Jai Ram got the Guru the post of a store-keeper of Nawab's state granary where the grain was collected as a part of land revenue and later sold. 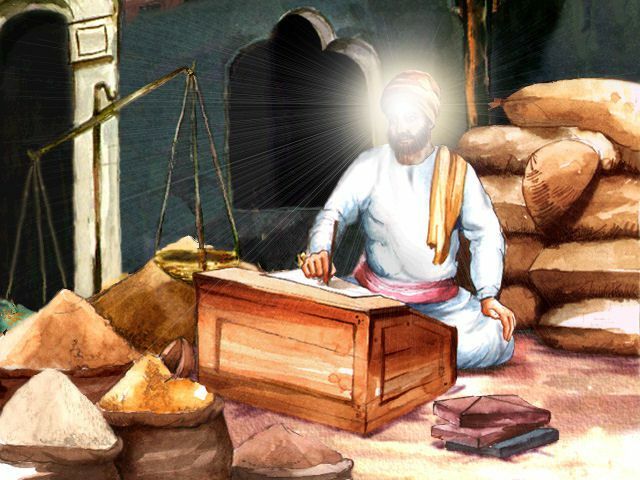 The Guru carried out the duties of the store-keeper very efficiently. The minstrel Mardana subsequently joined the Guru and other friends too followed. Guru Nanak introduced them to the Khan, who provided them suitable jobs in his administration. Every night there was Shabad-Kirtan (singing divine hymns). One day he was weighing provisions and was counting each weighing as 'one, two, three... ten, eleven, twelve, thirteen'. When he reached the number thirteen (13)- 'Tera' (in Punjabi language Tera means number 13, and Tera also means 'yours', that is 'I am Yours, O Lord'), he went into meditation. Guru Nanak went on weighing by saying, "Tera, tera, tera..." The customers were happy to receive the extra provisions and did not know how to carry so many goods. They could not understand the bounties of the Lord. Gurdwara Sri Hatt Sahib marks the spot where Guru Nanak worked as the Modi (person in-charge) of the Sultanpur Nawab's stores.